Ruth I. (Want) Weber, 88, formerly of Rising City, died Friday, February 16, 2018 at St. Joseph’s Villa in David City. 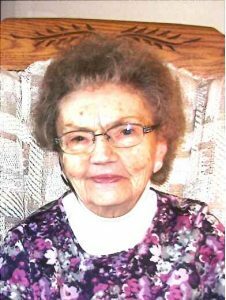 Visitation Monday, February 19, 2018 4:00 p.m. to 7:00 p.m.
Ruth was born on November 17, 1929 near Rising City to John L. & Hildegard (Rathje) Martens. She was the oldest of seven children and the family attended the rural, St. John’s Lutheran Church where she was confirmed. Ruth was a student at District 43 country school through the 8th grade when it became necessary for her to stay at home and help with her younger siblings. She married Ivan Want on August 21, 1949 and they lived on farms outside of Rising City and David City while they raised their four children, Roger, Judy, Barbara and Brian. Ruth was a typical farm wife, serving lunch in the field and cooking hearty meals for the family. She loved gardening, making ceramics, decorating cakes, cookies and her home with flowers, dolls and angels. Ivan passed away on February 7, 1989. Ruth then married Harvey Weber on December 7, 1991 and they lived in Columbus until Harvey’s death on January 17, 2014. She moved into an apartment in Rising City to be closer to family and then to the St. Joseph’s Villa Court in David City in 2015. She became a resident St. Joseph’s Villa in January of 2018. Ruth worked at David Place as well as the Columbus Livestock Café and was active in the David City VFW Auxiliary. She helped with Vacation Bible School at First Lutheran Church in Rising City where the family were members. Ruth is survived by son Roger (Cindy) Want of David City, daughter Judy Johnson of St. Paul, daughter Barbara (Mike) Hiatt of Rising City, son Brian (Kolleen) Want of Yankton, South Dakota, five grandchildren, Angela (Brian) Nelson of Bellwood, Adam (Christina) Want of Bastrop, Texas, Mindy Want of Commerce, Colorado, Shawn Hiatt of Rising City, Shane (Kylie) Hiatt of Rising City, eleven great grandchildren, one great-great grandchild, six step grandchildren and fifteen step great-great grandchildren. She is also survived brothers, Louis Martens of Kansas City, Missouri and Harold (JoAnn) Martens of Rising City, sisters, Irene Jones of David City, Mary Hoffman of Rising City and Luella Gable of Shelby. She was preceded in death by her parents, both husbands, a brother Lawrence Martens, brothers-in-law, Gary Jones, Merlyn Hoffman and Donald Gable, sisters-in-law, Margaret Martens, Wanda Martens, Charlotte Martens and a step grandson. Memorials may be directed to the family for future designations.